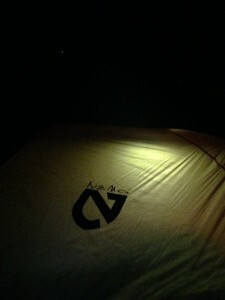 Introduction: Nemo’s newest two-person ultra-light tent, aggressively novel and with a cavalier disregard for stale design models, is attempting to offer the luxury of comfort, space, and convenience in a two pound package. But in order to do that, they’ve cut a few corners – literally. The tent has two opposing corners that are secured by a pole and two free corners that are secured by stakes. The unfortunate compromise of this design is that a couple must choose heads or tails. Like Big Agnes and Sierra Designs, Nemo has gone back to the drawing board with the traditional two-walled tent design, hoping to create a hybrid that utilizes both freestanding and non-freestanding qualities. And despite the inevitable side effects of early innovation, the Blaze 2P earns its place among the first wave of easy-to-assemble, two-walled ultra-light tents spacious enough for two people. Trail Weight: 2 lbs. 5 oz. Circumstance of review: In Nemo’s home state of NH, Indian Summer is a brief warm period that occasionally shows up after the first frosts have done their damage. With harvest over and most of the winter preparations complete, people are caught off guard by the burst of warm air that rushes in their front doors. 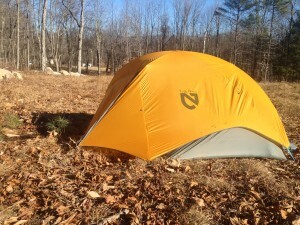 In this fleeting warmth, we were lucky enough to test out the Blaze 2P’s capabilities as a shoulder-season tent. 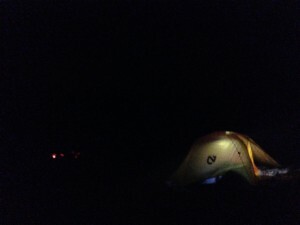 We camped in people’s backyards and along the side of trails, setting up in the dark. We threw up the little tent wherever and whenever it was possible. We camped at low elevation (below 2,000 feet) in windy, open clearings and wooded forests, and mainly in temperatures between the high 20s and low 40s. Unfortunately, we did not witness any rain storms. Set-Up: The set-up of this tent is incredibly easy. 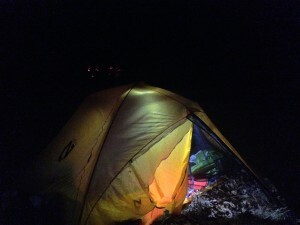 We mostly set this tent up in the dark, by headlamp (including the first time we set it up), and it took well under five minutes under even the worst conditions. 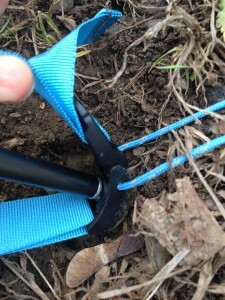 There is one pole with a small, attached cross section that snaps into place and six stakes. The main tent can actually stand up with only two stakes, which means it would be a fairly easy fix to make the tent freestanding in a pinch by tying off two guy lines. With the rainfly on, six stakes are required. Because of the rainfly’s unique design it isn’t possible to attach it the wrong way, but it is a little confusing once it’s on. 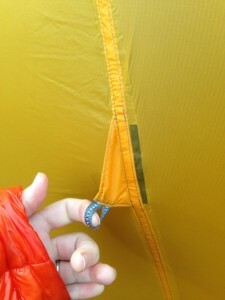 The zippers align – or don’t align – rather strangely with the inner tent; the inner zipper goes one way and the rainfly’s zipper seems to go the other way. But we had no issues getting in and out, so this is more of an observation than a complaint. We eventually got used to it, and it does seem like it would keep our backpacks dryer in the vestibule. From inside, the inner door zips to the right while the outer door’s opening is over left. I especially liked the attachments Nemo uses. 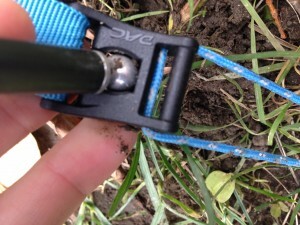 Rather than fussing with webbing loops or little buttons, the poles fit neatly into a ball-and-socket grommet. The hooks were very lightweight and designed to snap on and off easily, by twisting them slightly. As far as non-freestanding setups go, it doesn’t get any easier than this. 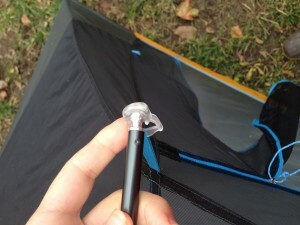 The ball-and-socket device that connects the main pole to the tent’s corners also has a small clip for the rainfly to attach to. It snapped together easily, was adjustable (for the rainfly), and was very secure. 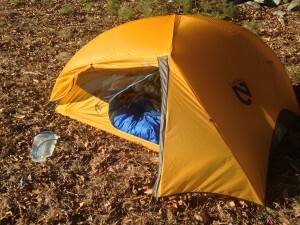 Comfort: The tent is more spacious than any two-walled tent in its weight class, but comfort is impeded by the design. Unfortunately, the two corners that are staked out tend to sag. Pitching this tent very tautly can alleviate this somewhat, but not eliminate it as a problem. 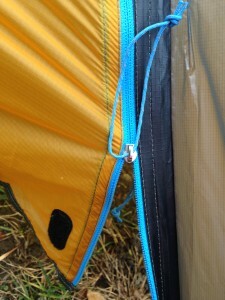 There are also a few tie-offs on the rainfly and a length of cord included, but these additions seem to be for directing water run off and not to improve the inner tent’s structural integrity. 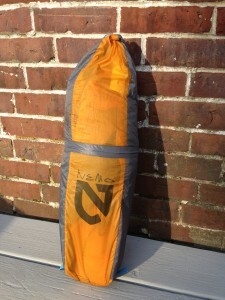 Figuring out the learning curve of proper pitching is nothing new for an ultralight tent, and the Nemo is still much easier to set up than other options that employ trekking poles and guy lines – but the reason that this is a major, and not a minor, problem, is that the tent is very well insulated. 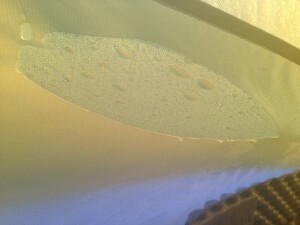 A ton of condensation forms on the inside of the rainfly and on the brief single-wall of the inner tent in humid or semi-humid environments. 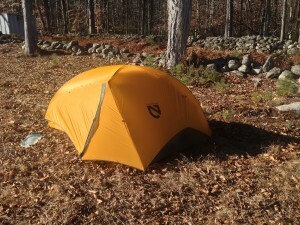 There is a good amount of moisture in the air on the East Coast, but we also tested this tent in the driest season, often after weeks without precipitation. The way it’s designed, one person will have the tent sag near their feet and the other will have it sag near their face. 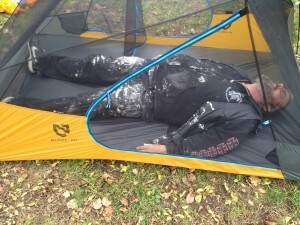 Ultimately, if you are over 5’10”, your face or the bottom of your sleeping bag ends up wet. …But I had more foot room. Our apartment’s handy man kindly stopped painting to model for me when I set it up in our backyard. He is six feet tall. 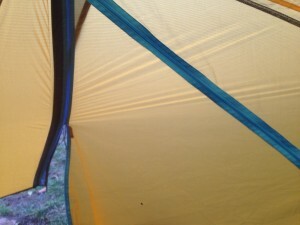 The other issue we had with the comfort of this tent was sizing. It is spacious, but it is not 85” long. 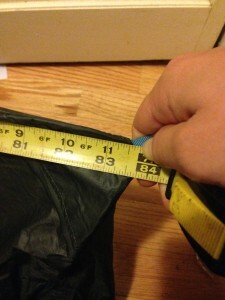 We measured it along a seam and, even when pulling the tent as taught as we could, didn’t get more than 83 ½ inches for length. 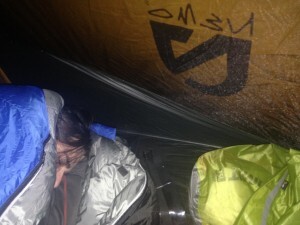 It sounds like I’m being pedantic, but when all 6’3” of my hiking partner was crammed into the tent, he found that both his feet and his head pressed against the ends, pushing them into the condensation. In short, anyone over six feet tall will probably have some contact with the ends unless they are able to sleep diagonally. Weather Resistance: Unfortunately we haven’t yet tested this in the rain (the downside of testing in a dry season), but we did test this tent in cold conditions. It is incredibly warm, to the point that my hiking partner asked me if it was a four-season tent. With the rainfly staked low to the ground, the air in our tent was thirty degrees warmer than the outside air when we woke up. The morning after a frost, we were surprised to open the flap to a rush of cold air and our frozen platypus tube – it was easily 60 degrees inside our tent. Obviously, the fantastic insulation of this tent contributes to the condensation issue, but it does seem to keep the outside elements out. We camped without a footprint on an area in the dark only to find in the morning that our campsite was much swampier than we realized. But the bottom of the tent had stayed bone dry through the night. 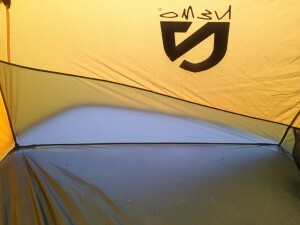 The lower single wall of the tent collects pockets of moisture during the night. Later that day (and after we had left the tent for a few hours), the lower wall is dry. Pros: I love how easy the set up is, and how sleek and ergonomic the whole tent seems to be. In addition to the two pockets, the tent also has a tiny pocket on the top which we failed to even notice the first few times we used it. It’s the perfect size to hold a headlamp so the tent can be nicely lit up. Even with the tent being shorter than we expected, the width was good and we were able to bring in gear without feeling cramped. Being a cold sleeper who regulates temperature terribly, what I most love is the Blaze 2P’s flexibility with temperature. 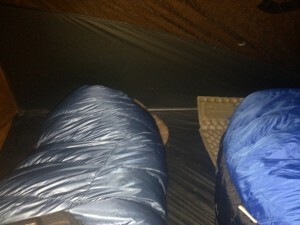 I slept warmly in temperatures which matched the temperature rating of my sleeping bag (which, for me, is unheard of). I always brought a silk liner but never needed it. 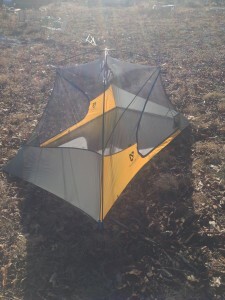 And when summer comes around, I know I can simply take the rain fly off and enjoy a warm, breezy night with the mesh. Cons: A few minor complaints: The zippers are a little flimsy on this tent. They are extremely lightweight and snagged on us a few times. We haven’t had any major issues with them but it’s something that I am keeping my eye on. Also, although there are two pockets below, only one person can easily access their pocket because the other person always has a pocket at their feet instead of their head. 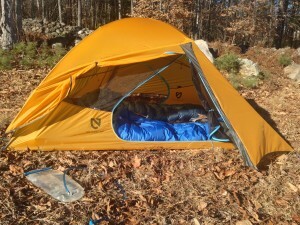 The whole design of this tent feels like it would actually be easier to sleep head to toe rather than head to head – which might work for some couples, but I’d rather not wake up face to foot. Our pitch here illustrates the sag somewhat. The major con is what I’ve already discussed at length: the sagging corners and high condensation make this a liability for taller people (at 5’4”, I didn’t have any issues). I do believe that Nemo can and will fix this problem by possibly attaching some extra guy lines or supports on those corners (I have half a mind to experiment myself). Value: This tent is accurately priced and accurately labeled as a two-person, three-season, two-walled, non-freestanding tent that weighs only 2 pounds. 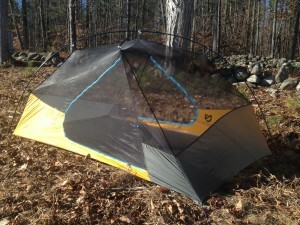 It is truly a remarkable tent but could still use some tweaking. The length is not completely accurate on this tent, although I suspect that a lot of companies fudge these things just to stay competitive. With that being said, I would recommend this to a couple that is short to average height or for a single person – especially to be used during a shoulder season. If someone is over 5’10” and expecting to share a tent, I would not recommend this tent in its first edition. I am, however, holding out hope for the future. Your review arrived at the perfect time, thank you! My husband (Chuckles!) 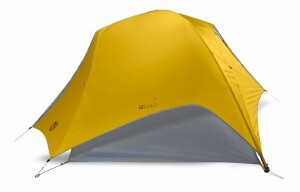 and I are hiking the CDT next year, and we’ve been researching tents. The Blaze was on our list, but since Chuckles is 6’4″, we’re crossing it off the list. I’m so glad it was helpful! It’s hard to find a tent for tall people! 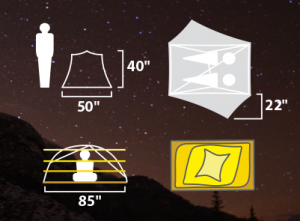 You’ve probably done a lot of research already, but we’ve found Tarptent’s tents to be long enough and I’ve heard good things about Six Moon Designs. Thanks for writing such a thorough review. As your review was some time ago, I’m wondering if you’ve had an opportunity to test Nemo Blaze further. Does the sagging and condensation continue to be a problem? 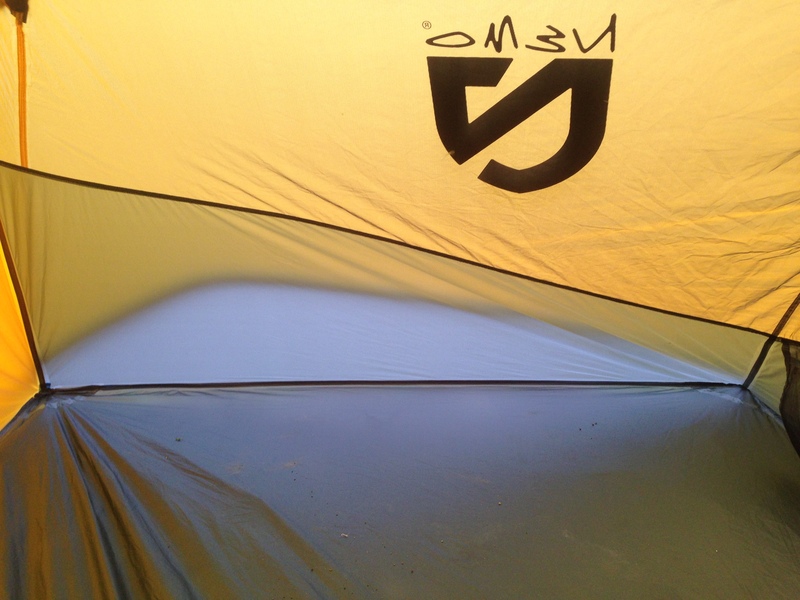 How has the tent stood up to poor weather such as rain and high wind? Thanks!